Have you thought about what it means for your family if something unexpected should happen and you and your partner? Time flies by too quickly, right? Life is a roundabout of children’s schooling and sporting events, looking out for your ageing parents, keeping up with demands of your working life, trying to find a little ‘me’ time and of course finding quality time with your partner. Before the year runs away from you, take stock, get the things done that fall into the ‘not now, but I’ll get to it later’ category. Making your Will is one of the most important things you’ll ever do, so isn’t it high time you got your head out of the sand and made it real? One thing to get sorted is your will. Granted, no one wants to think about their departure, but have you thought about what it means for your family if something unexpected should happen and you and your partner are no longer around? With all the swings and roundabouts life presents, be sure to revisit your will every time a major event occurs. An up-to-date will helps ensure the important people in your life are looked after. and you can store your original will in The Victorian Will Bank. When storing your will it is a good idea to let someone trusted know where it can be located. No matter how straightforward or complicated your situation is, State Trustees professionals can help you prepare your will. Call us today on 03 9667 6444 for a confidential, obligation-free discussion about your circumstances. 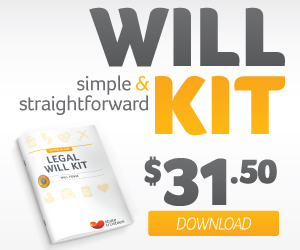 In addition to our face to face will writing services, you can purchase a State Trustees Legal Will Kit online or buy a copy from major Australia Post stores or selected newsagency outlets in Victoria.